In the summer of 1881, a mystic, shaman, herbalist named Nakaidoklini rose to prominence on the San Carlos Reservation in southeastern Arizona. Nakaidoklini was a small man who belonged to the Cibecue band of the White Mountain Apaches. 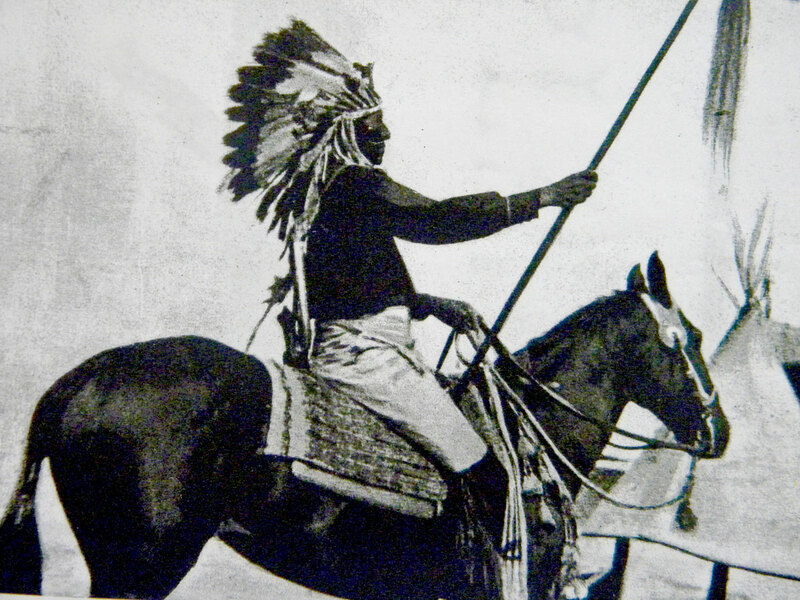 In one of his many visions he saw the Apache returning to power and the new white European/American's vanishing. He also saw the return of the buffalo. At the time the living conditions at the San Carlos Agency were deplorable. Food was always in short supply, and the Indian Agents and their suppliers were corrupt. Most of the food and supplies they were suppose to give to the Apache was sold on the black market instead, and the housing was also substandard. Due to the lack of space they were living on top of each other. It was easy to understand why Nakaidoklini found a captive audience that was ripe for rebellion. It didn't take long before things started getting out of hand and the Indian Agent at San Carlos began pleading for help. Only a short time later, the agent convinced Colonel Orlando Wilcox that Nakaidoklini was a danger. Wilcox ordered veteran Indian fighter Colonel Eugene Carr to arrest Nakaidoklini. Carr responded by telling Colonel Wilcox that arresting the medicine man would be a big mistake, and that it would only incite more trouble. Colonel Wilcox did not believe him. On August 30, Colonel Carr and his men reached Nakaidoklini's camp on Cibicue Creek with 2 companies of cavalry (85 men)and 24 White Mountain Apache scouts. There Nakaidoklini was told that he was under arrest and had to go with them or be killed. Nakaidoklini scoffed at their suggestion as he told them that he would never be killed. It didn't take long for his Apache disciples to attack. They were soon joined in the shootout by the White Mountain Apache scouts. The soldiers had orders to shoot Nakaidoklini first, and the Sargent of Arms did so several times. The soldiers also shot his wife and family members. Both sides were locked in a furious exchange of gunfire until darkness. At about that time, Colonel Carr ordered a retreat. He had lost 8 soldiers and 6 scouts, and Nakaidoklini's had lost 12. Over the next three days 8 settlers would be murdered. To make things worse, the Apache attacked Fort Apache itself. News of the incident was reported in all of the newspapers across the United States. Eventually, three of the Apache scouts were hung for mutiny. The news of Nakaidoklini's death, gave the Apaches on the San Carlos Reservation a reason to leave. Among the first to leave were Naiche, the youngest son of Cochise, Geronimo, and Natiotish, the White Apache leader. They were accompanied by more than 70 warriors. The first thing they did was attack a wagon train killing 3 soldiers and 7 civilians. Then in July 1882, as Natiotish prepared to ambush Captain Adna Chaffee and the 6th Cavalry, he didn't realize that his intelligence was old. Natiotish didn't know that Chaffee had been joined by Major Evans and an additional 5 companies. The Apaches would lose over 25 men in during what would become known as the Battle of Big Dry Wash. Natiotish was also killed, and those that were not killed were captured. This was the last battle fought between the Apache and the U.S. Army within the Arizona Territory.